NANO ROYAL JELLY is the 1st Organically Certified Pure Royal Jelly from New Zealand. Take 2 capsules every day to BOOST your BEAUTY Collagen 3X today! Highly Recommend Hope it work for me. While my first consume feel my finger tips turns cool, wondering whether i should reduce to 1 pill each day. Luckily the situation become better for second consume. Hope it work for me. Repurchase intention will depend on the result after 2 bottles. Received really late due to no stock & have to order numerous times. Miss out good discount also. Really disappointed this time. Good afternoon to you. To get RM73.80 each for NANO Royal Jelly will only show after you apply Qoo10 RM10 Cart Coupon + RM30 Cash Angpow + RM20 Shopback Coupon + RM30 Shop Coupon (available on 20-22 Feb 2019) to offset the total amount with minimum purchase upon checkout. Kindly be assured that we always follow our promotion closely. Hope this clarifies. 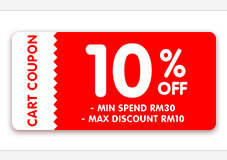 (RM103.80 x 3) - Qoo10 RM10 Cart Coupon - RM30 Cash Angpow - RM20 Shopback Coupon - RM30 Shop Coupon / 3 = RM73.80 each as per advertised. Hi I still didn’t manage to get the mentioned coupons. How could I get these coupons in order to get rm73.80? Good afternoon to you and thank you for interest. For your information, the cash rebate is offered by Nano Japan directly. Once you have purchased the required package (quantity) as per described in the listing, the cash rebate will be triggered and enclosed into your parcel automatically. In another word, you will receive the cold hard CASH rebate (real money real cash) when u receive your parcel! ^^D Hope this clarifies. Ok since I have missed the earlier bargain. This round i wish I could enjoy this deal as advertised. Please advise how to proceed to entitle the deal as I still didn’t manage to get it. It is so complicated! Good afternoon to you. Thank you so much for your enquiry. Currently NANO Royal Jelly is on low-price promotion. So the coupon cannot be applied... :) However, please don't feel disappointed as we are running promo for buy one NANO Royal Jelly only at RM79.90!!! It's a fantastic deal! Hurry! :D Don't miss it again!!! [ Qoo10 Lowest Price ] ★NEW★FINE JAPAN Hyaluron and Collagen coenzyme Q10! !